After processing, thick and thin-film resistors will always have some statistical variation from their intended value. In the case of separate chip resistors, parts can be measured, then binned into 10%, 5% or even 1% tolerances (standard RETMA values). In larger format thick-film or thin-film networks where the resistors are just one small detail in complex artwork, often the final part will not work if the resistor value deviates too much, and out-of-spec resistors means scrapped parts. The alternative is to trim the resistors into the correct value. In laser trimming, a YAG laser is used to ablate the resistor material from the substrate, raising its resistor value. Rule of thumb: Note that you can only trim a resistor up in value, not down. There are three ways to laser-trim resistors, shown below. 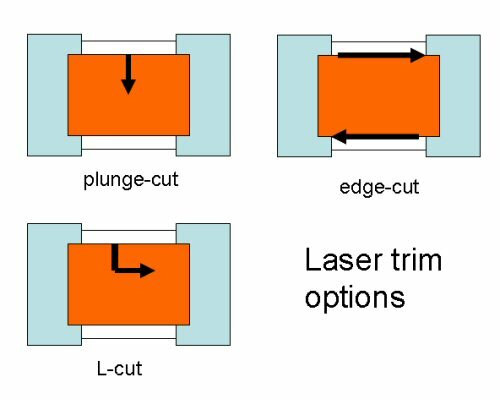 Plunge-cut gives the "fastest" resistor change, but from a reliability point-of-view, it may , may , L-cut, edge trim, etc. In a "poor-man's version" of laser trimming that is sometimes used in prototype shops, you can abrade a resistor with emery paper to raise its value. Here you are actually decreasing the effective thickness of the resistor, rather than altering the number of squares. Thin-film resistors will have to be re-stabilized after this step, since you would be removing the oxide layer.